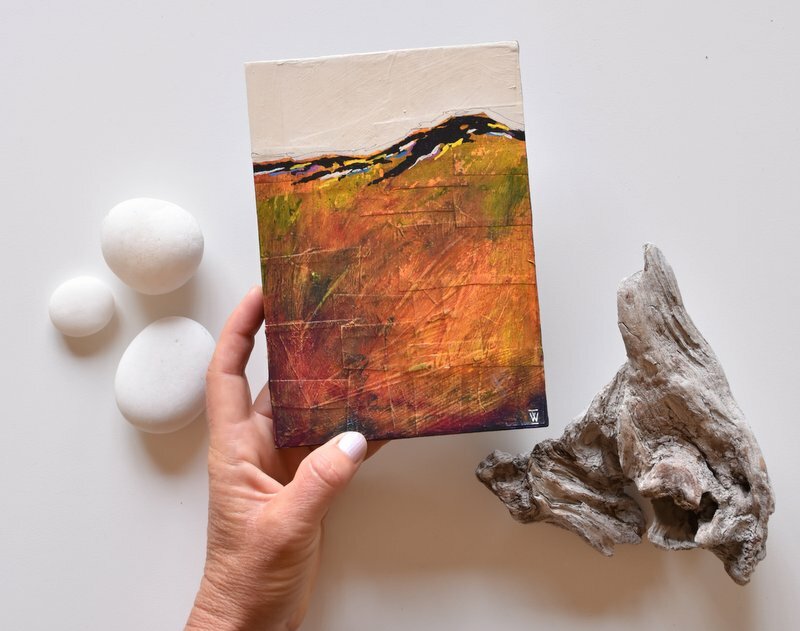 So I have a new set of little abstract paintings - 2 on wood, 5 on canvas. 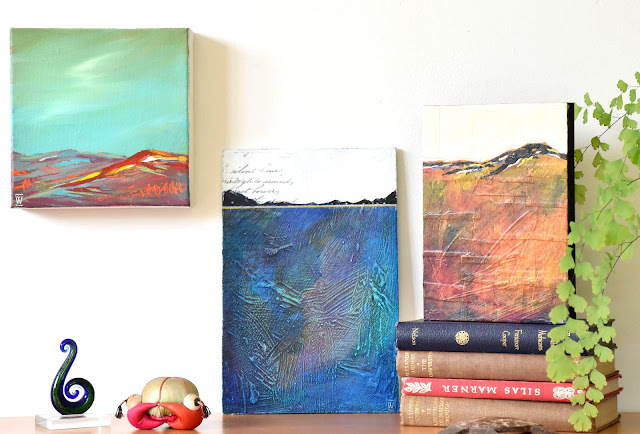 They're really fantastic, affordable art and they are all available here ... small abstract paintings for sale. Finishing touches with the tiniest brush imaginable! All seven mini abstracts are available here - small abstract paintings for sale. At first glance this painting seems to be almost monochrome, a calming and serene blue and white. 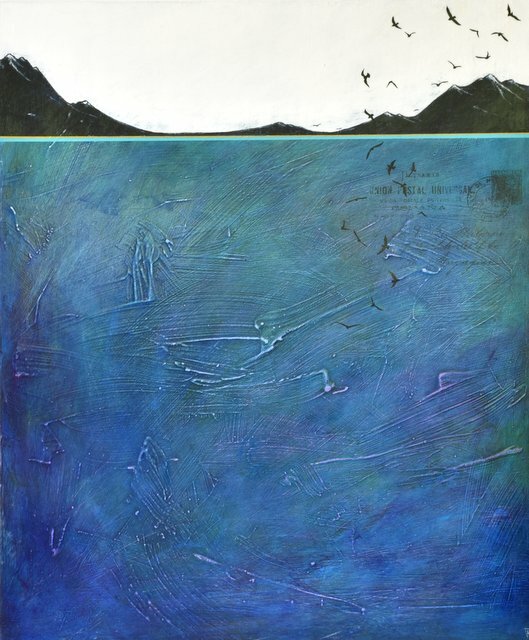 A closer look reveals a rich layering of colour, creating a depth to the water in the foreground. 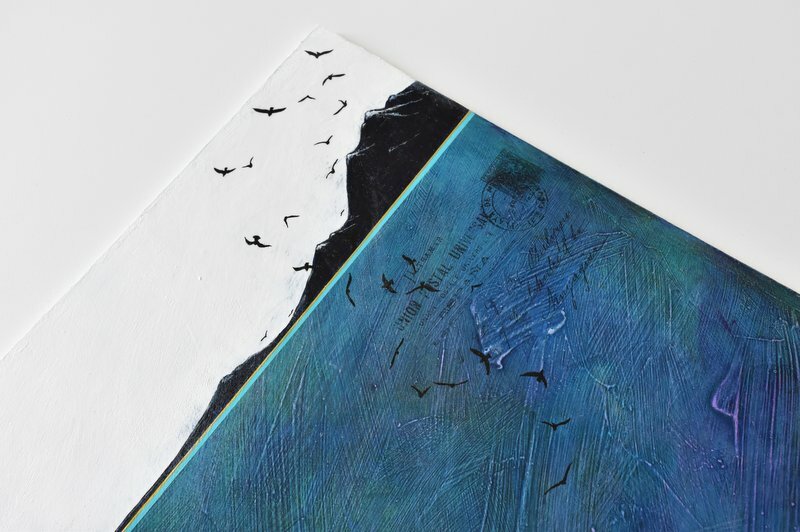 The sweep of birds over the mountains is a contrast to the calm of the blue lake and, along with the vintage postcard image, represents a journey at the change of seasons. 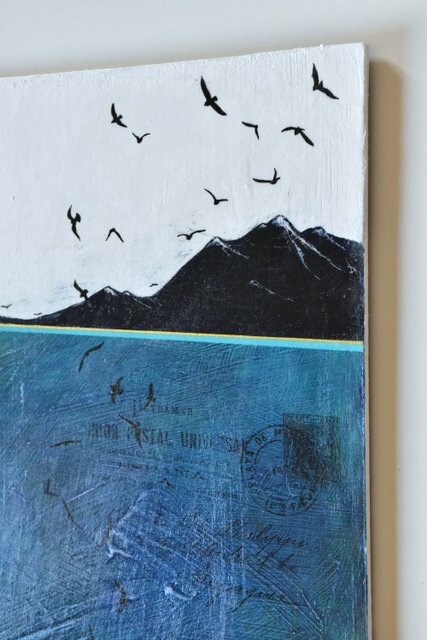 "Heading South" is available for purchase - Available here. 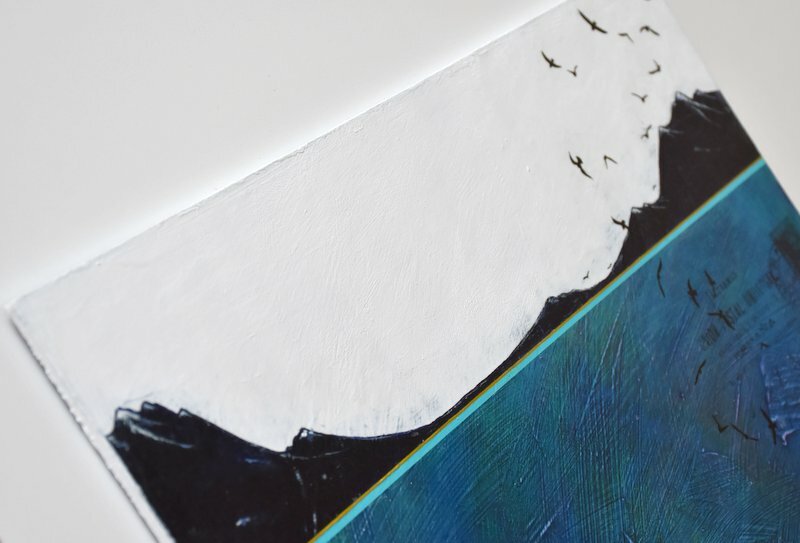 This afternoon I added a new section to my shop with a number of small abstracts. I love painting these little gems. It's fun to use them to add a little touch of colour to a shelf or wall. And, somehow, small paintings seem to draw you in to see all the details. 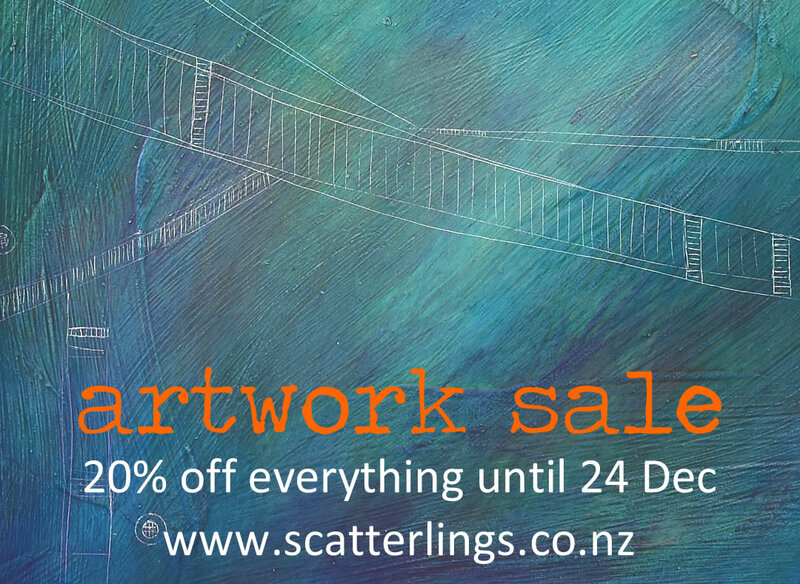 Available here - www.scatterlings.co.nz/small_abstract_paintings_for_sale.html and on sale until 24 December. 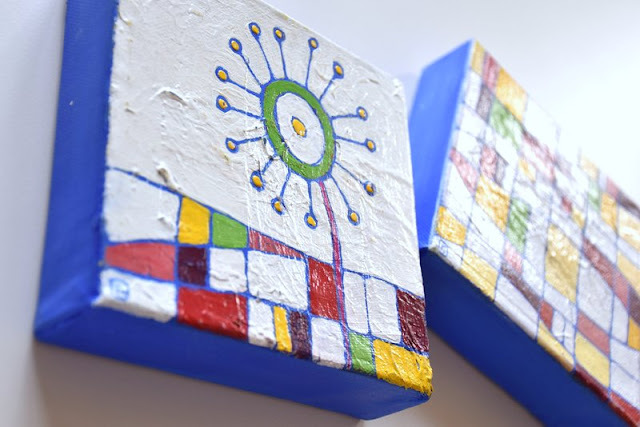 Colour Me Happy - 2 small abstract paintings to hang together. 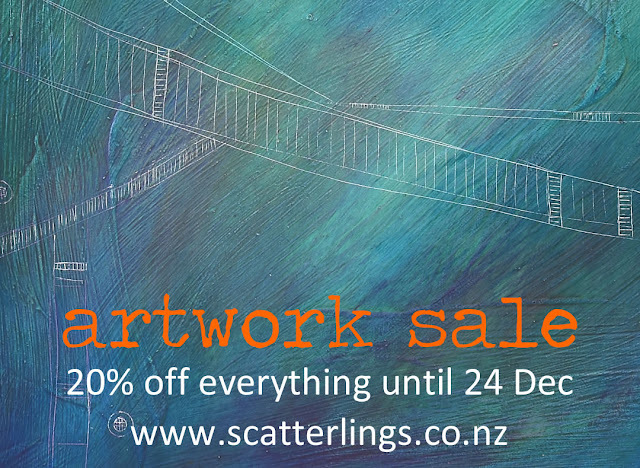 So to clear some space in my studio and my home, I'm running a special on all artwork on my website until 24 December. This will include all new paintings I add to the shop in the next few weeks. Yippeeeee! As often happens when I start a new series of abstract landscape paintings, each new one becomes a bit simpler in composition as I eliminate elements and find that sweet spot in painting the essence of what I am trying to say and how the series is making me feel. 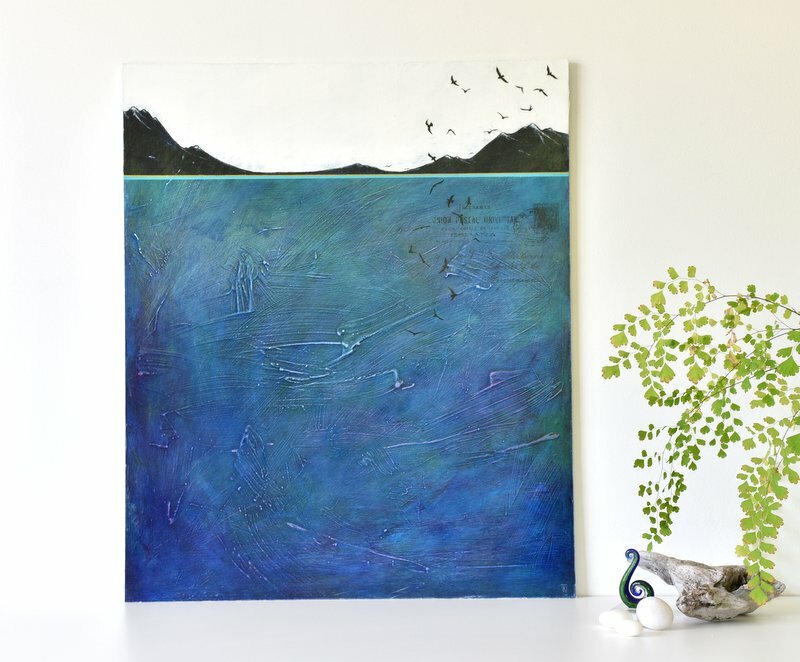 This painting is larger than the previous two, and yet the simplicity feels right. The depth of colours and the minimal lines feel enough for me. I'm falling in love with these layers of blue more and more. The second one in this series of blue abstract landscapes. The almost pearly blue-green colours reminded me of bits of worn glass you pick up by the sea. Inspired by the beautiful Lake Hawea, which is just 5 min walk from home, I am currently painting a group of abstract landscapes in a range pretty blues. 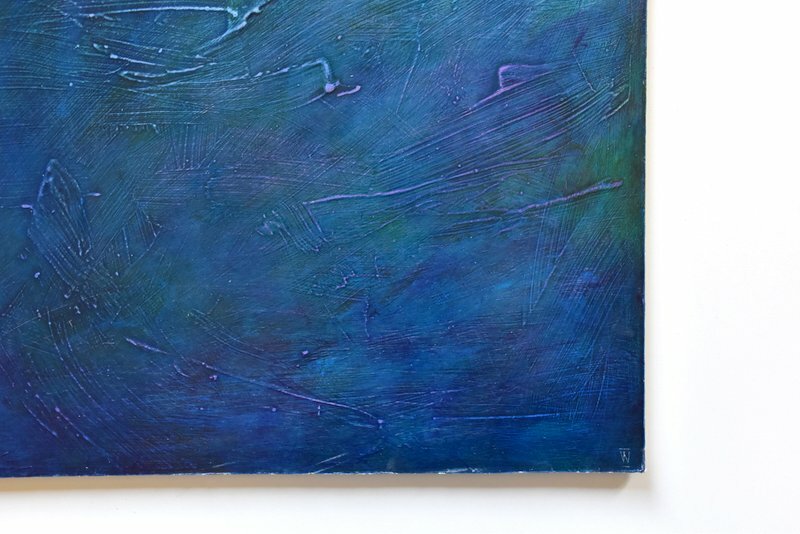 The blue colours filling my studio at the moment are a wonderfully refreshing contrast to the heat outside. They represent bridges, the connections between places, travel and journeys. As a South African born New Zealander who currently spends 6 months a year in Europe, journeys (both physical and spiritual) are an ongoing theme of mine. 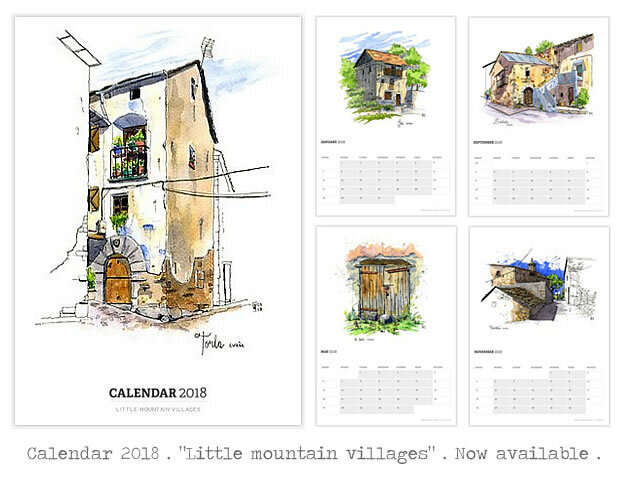 I took a trip down memory lane yesterday and made a calendar with 13 of my sketches of little mountain villages in France, Spain and Italy. It is available through Redbubble and can ship anywhere in the world. I hope you like the choices I made. I can tell you it wasn't easy, but it was such fun paging back through my sketchbooks. Two months in France have just flown by and I have finished my first large sketchbook - the Fabriano one shown above. I've also added scores of little landscapes sketches to my little pocket Moleskine I take hiking with me. We didn't travel around all that much this time, just staying in a few of our favourite places and catching up with as many friends as we could. Here are a selection of completed sketches from some of the little villages we visited. The super, super old 'La Mere Eglise', Devoluy, France. Getting caught up in the details. Old door, Le Seuil. This summer, as we travel around Europe, I am sending original watercolour postcards to people all over the world. You can see one I sent from Fouillouse a couple of pictures above. To enter to receive a postcard you should follow me on Instagram or Facebook. Au revoir! Until next time which will probably be from Spain. My poor blog has been unattended as we travel through Europe, because we haven't had enough mobile data to keep it up to date. Today I'm at a friend's house in France and I thought I'd hop onto their wifi and do a bit of time travelling back to little villages in Spain. Tella, Spanish Pyrenees. This sketch is sold. Torla, gateway to Ordesa National Park, Pyrenees, Spain. Historic house, Sin, Spanish Pyrenees. Watercolour postcard of a Ermita near Tella, Spain. A number of people have asked if my watercolour sketches are available. They certainly are! They are easy to remove from the spiral bound book. A few sketches have already been sold, but a number are still available. You can purchase them if you see me in person. Or you can message me about a particular sketch and I will post it to you when we return to New Zealand. Original sketches are 85euros + postage if applicable. You can view all the sketches from Spain on Instagram. I've taken sketching gear pretty much everywhere with me. I even took a super super lightweight kit with me when we went on a climbing trip to Patagonia. But over the years my hiking kit has become more and more elaborate. And when I bought a big, new, fancy camera I couldn't fit both it and my sketch gear in my bag. So, shame on me!, I've been hiking with my camera instead of my sketchbook for the last 6 months or so. A couple of purchases was all that was necessary to create a new super lightweight sketch kit and I've been sketching (and photographing) in the hills again. And a little baggie from our flight on Emirates for putting it all in. I'm having so much fun stopping on my big walks and taking in all the sights, smells and sounds. Catching little critters unaware. Taking time to breathe. I should have a follow up post with my more elaborate kit that I take when I do my urban sketches. In essence it mainly varies by having a much bigger palette, nice fountain pens, and a variety of good watercolour brushes. It's a crazy life. This week we've been immersed in enjoying autumn and next week we'll be enjoying spring. Yes, it's time to pack again for our annual migration to the Northern Hemisphere. Time to pack up the house, and my studio, say goodbye to our beautiful dog and head to Spain for adventures in our little van. Last couple of days of the crisp, frosty mornings, calm days, spectacular autumn colours, bike rides and swims with Zulu dog. You can follow my sketching adventures here on this blog, on Facebook or Instagram.